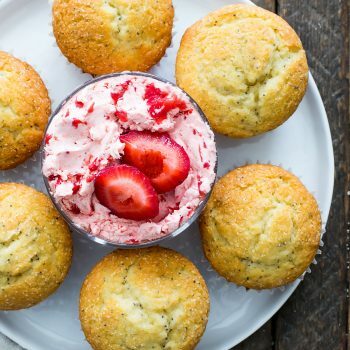 Almond Poppyseed Muffins with Strawberry Butter – These muffins are so fluffy and airy, they just melt in your mouth – and such a cinch to whip up! Almond, poppyseed, strawberry….. 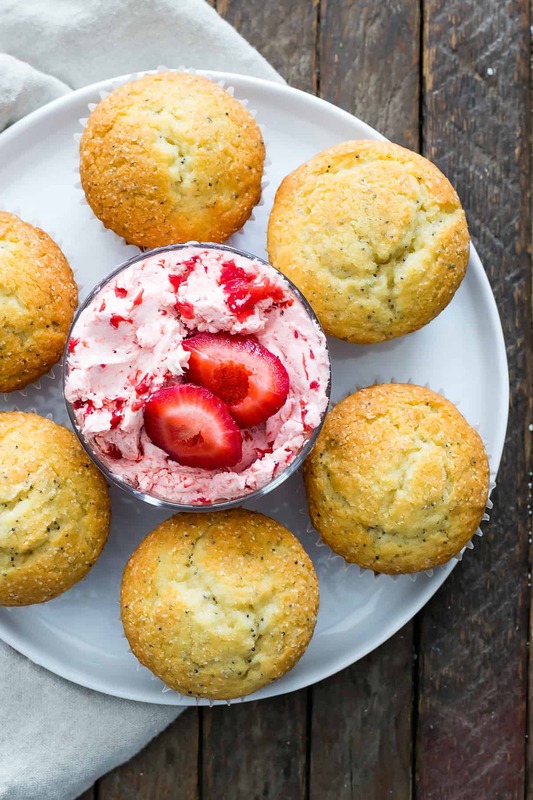 SO many amazing flavors working together here and I’m in h e a v e n. These muffins are so fluffy and airy, they just melt in your mouth and if that’s not enough, they’re served with a creamy strawberry butter you will go absolutely crazy for! Such a cinch to whip up and it will completely transform your muffin-eating experience. Sweet and fluffy, whipped Strawberry Butter is the perfect topping for summer baked goods. This is a great way to use up strawberries that are a bit past their prime, but perfectly ripe ones will do, too. In large bowl, cream together butter, sugar, eggs, almond extract and sour cream. Add dry ingredients to butter mixture and mix until combined, being careful not to over mix. Stir in poppy seeds. Fill muffin tins about 2/3 full until batter is all used. Bake for 12-16 minutes until a toothpick inserted into center comes out clean. Place on wire rack to cool. Sprinkle strawberries with sugar and mix well. Let stand at room temperature 30 to 60 minutes. Drain off liquid and discard or set aside for another use. Add drained strawberries, butter and salt to bowl of electric mixer. Mix well until incorporated and fluffy, about 3-4 minutes. Serve immediately with warm muffins or refrigerate until ready to serve. This post is in partnership with Go Bold With Butter – thanks for letting me work with the brands I love! Try these other Muffin Recipes you'll love! hey girl These look so good! Yummy!